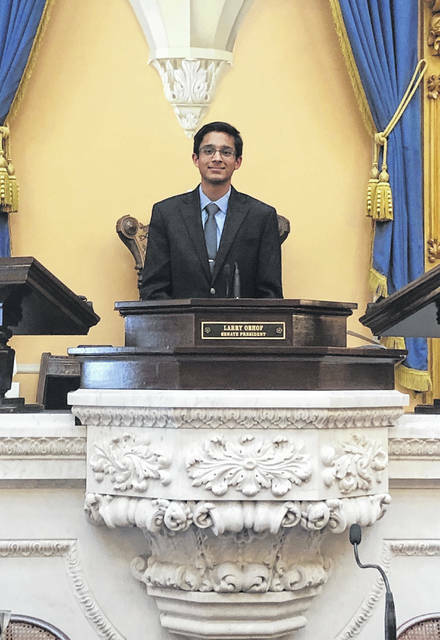 Olentangy High School senior Karan Agrawal earned a spot in the National Speech and Debate Tournament in June after winning an event at the Ohio Statehouse last month. After placing first at the Western District Speech and Debate Tournament held at the Ohio Statehouse last month, Olentangy High School (OHS) Senior Karan Agrawal will have the opportunity to compete in the National Speech and Debate Tournament. Agrawal, who competes in congressional debate, went up against students from the Columbus, Dayton and Toledo areas, beating out 60 other competitors to earn the bid to nationals. The National Speech & Debate Tournament will be held in Dallas, Texas, and will begin on June 16. Congressional debate puts students in a mock Senate or House chamber. Students are given pieces of legislation and are tasked with giving speeches and counterarguments against or in support of the legislation. Agrawal began participating in debate during middle school. As an eighth-grader, the club was allowed to compete in a high school event, which further piqued his interest. At that time, OHS did not have a debate club, but the coordinator of the middle school program started the high school club, which allowed Agrawal to continue his debate career over the past four years. Asked what the most important components of a successful debate are, Agrawal pointed to research and preparation. Agrawal said what he enjoys most about competing in speech and debate competitions is the “breadth of topics” he is able to learn about. “I’ll get a piece of legislation, have no idea what it is, and then when I start researching, I’ll realize that it’s a huge issue in society today,” he said. He added congressional debate gives high school students a voice to make changes in their communities. He specifically referenced the shooting at Marjory Stoneman Douglas High School in Parkland, Florida, as a time when mock debate legislation pieces on gun reform spiraled into a national debate during the national tournament. While Agrawal said he’s always been someone who will speak out on certain topics, speech and debate have helped him overcome some of his shyness and has given him a lot of confidence. He went on to say competing has only furthered his passion for seeking change, adding that while a career in politics isn’t something he’s chasing as of now, it could be something he looks into down the line. As of now, Agrawal is unsure if he will be able to attend the national competition, citing “logistical issues” that may keep him from competing. If he is able to compete, Agrawal said he is most looking forward to meeting new people, all of whom are some of the most skilled, young debaters in the country. While the national tournament may mark his final opportunity to compete in high school, Agrawal could continue his speech and debate career into his college years. After graduating, he will head to Northwestern University where he will major in industrial engineering. He noted Northwestern has a strong speech and debate program, and he will look to get involved with it once he gets to Evanston, Illinois.